Although the blacksmith has been a craftsman in England since the earliest days, it was only in the reign of James I (1603-1625) that an infusion of foreign skill made it possible for England to produce sword blades which compared in quality with those of the mid-European states. In 1620 there opened on Hounslow Heath a smithy for the manufacturing of sword blades which employed a large percentage of European swordsmiths. Hounslow Heath at that time stretched for five miles along the road west of Hounslow (which had been known in the Domesday Book as 'Honeslaw'). This was only a village, and the Heath purely an open space on which the villagers grazed their cattle. In later years the Heath became famous for highway robbery and gibbets were to be seen on both sides of the road. The sword-smithy was in existence when Charles I came there with his troops in 1642. The swordsmiths of Hounslow, whose names are still on record today, were—Joseph Jenekes, who came from Solingen, Johann Kindt, also from Solingen, and Benjamin Stone, who was one of the English swordsmiths who joined them there. The factory was well established and organised at the time of the civil war, and supplied the parliamentary party with a large number of swords. 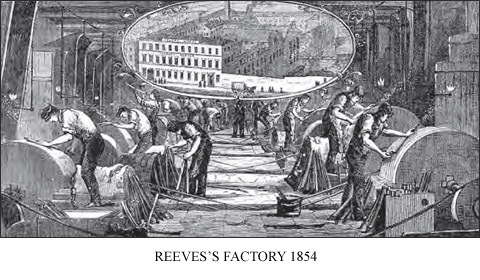 With the growth of the factory more and more immigrants came across; names that are known being—Johan Hopple, Peter Munsten, and Recordus Hopkins. In the 1660s they apparently lost interest in the Hounslow factory and all of them except Kindt, returned home. Kindt, however, changed his name to Kennett, became a naturalised Englishman, and stayed on. Naturally, this was but one factory which supplied sword blades, but there is no doubt that at the time it was probably the most successful. In 1690 Herman Mohll started the Hollow Sword Blade Company at Shotley Bridge near Newcastle. This company prospered until 1703, when Mohll got into trouble with the law through smuggling sword blades into the country from Germany, and very soon the Hollow Blade Company went into liquidation. However, it re-opened immediately under the name of Herman Mohll & Son and continued to run for the next 21 years under that name. 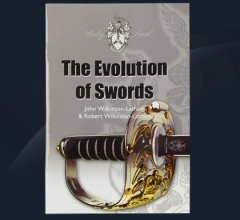 The development of the Sword over thousands of years has given us many varieties of Blade and Hilt. Blades-with cutting edges on both sides, single edged Blades, Straight Blades, Curved Blades and Blades purely for thrusting. Hilts have varied from simple grip and cross-guard, natural in use but giving very little protection, to complicated basket-hilts, giving ample protection against the cut but none against the thrust and cramping the hand so as to make swordplay most difficult. 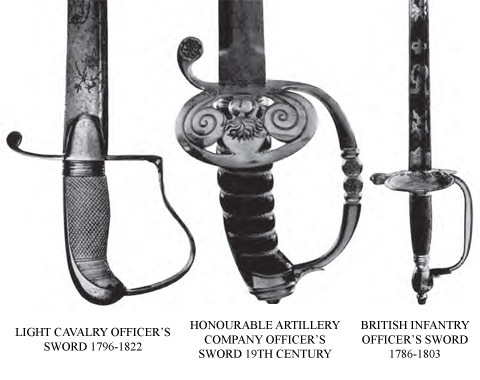 It was not until 1908 when a British War Office Committee, which had sat intermittently since 1884, produced the 1908 pattern British Cavalry Troopers' Sword, which is reputed to be the most perfect Sword ever designed. A great triumph, but unfortunately it came at a time when the Sword, as a weapon of war, was completely outmoded. Sword making in the late 18th century and early 19th century concentrated around Birmingham where not only were the needs of the army and navy satisfied but blades were made for the finer officer’s swords for the London makers. London ‘makers’ were mainly jewellers, hatters and outfitters and were more sword assemblers from parts bought in, suitably embellished and ornamented under their direction according to the whim of the purchaser. That is not to say a free hand was allowed as there were, by the 1800’s, regulations to govern the style of the weapon. These, as we know, were more often than not flouted, which is explained by the great number of ‘variations on a theme’ that exist today in museums, collections and available for collectors from auction houses and specialist dealers. The names of the manufacturers of the Birmingham Houses at this time were a mixed bunch, some superb craftsmen and others good makers capable of turning out government work at the right price. 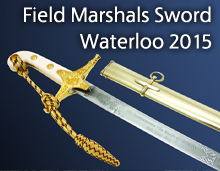 Names such as Harvey, Osborne, Reeves, Mole and others supplied the majority of swords required by the Government. They also supplied London ‘makers’ with blades and sometimes complete swords. As the 19th century wore on, many of these Houses fell by the wayside so that by 1869, the only manufacturer left able to completing Government work was Robert Mole and Sons, who had first started making sword in 1835. Perhaps the most famous name in swords, Wilkinson, did not start making swords until 1844 and then for officer’s only. 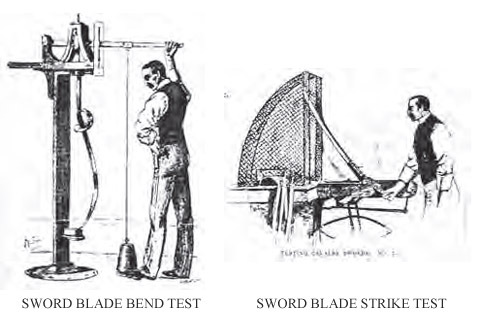 Wilkinsons unique ‘Proof’ of his blades by his ‘sword epprovette’ (essentially a blade bending machine) meant that unlike previously with poor methods of testing, his blades were subjected to the most rigorous bending and striking before being placed in the hands of the purchaser. As the years progressed, they started supplying their swords to tailors and outfitters as well as from their headquarters at 27 Pall Mall. In 1887, having bought Reeves of Birmingham in 1883, Wilkinsons entered the Government contract market competing with Mole for orders. At this time of change and a more scientific approach to sword design, Wilkinson and Mole supplied their expertise to War Office Committees considering new edged weapons and influenced the design but more importantly the improvement in testing of blades and swords. During the First World War, both Wilkinson and Mole produced huge quantities of cavalry swords and bayonets and still managed to keep supplying the private purchases of officers, who were still required to carry them. In 1920, Wilkinsons absorbed Robert Mole and in 1922 took over the last two small private sword makers, Thurkle and Pillin. In August 2005, the very distinguished sword makers Wilkinson Sword, who had been established for over two hundred years, ceased trading as sword makers to concentrate on the more lucrative business of making razor blades. Robert Pooley, who had been commissioning swords from Wilkinsons for over forty years, purchased from Wilkinsons their drawings, spares and much of their tooling including both heavy and light machinery. A Ryder Mechanical Hammer which was built in 1886, was also amongst the machinery purchased. Pooley Sword was formed in November 2005 to produce Military and other swords in the ‘Wilkinson’ tradition of quality and craftmanship, employing ex-Wilkinson craftsmen and technical expertise. All Pooley Swords are forged from carbon steel and tested to the highest standards in the traditional way as laid down by Henry Wilkinson. The finished sword is finally etched and finished to the same fine standards expected by the British and Commonwealth Armed Forces. 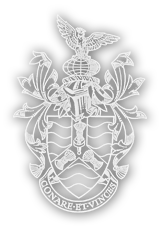 Pooley Sword is now established as the leading supplier of swords to the British Armed Forces and MOD as well as many Commonwealth and Overseas Defence Forces.